Eugène Delaplanche (French, 1836–1891) A Very Fine French 19th Century Brown and Parcel-Gilt Patinated Bronze Sculpture Titled "La Sécurité" (The Security - Protection) Depicting a sitting young Maiden in a gilt-decorated armored suit and helmet, a lion skin on her back, holding a resting child on her arm. Raised on Rouge-Royal marble plinth inscribed "La Sécurité - Par E. Delaplanche - Salon des Beaux-Arts de Paris". Signed: E. Delaplanche and stamped with the importer's seal - Alberto Vignes y Ca - Buenos Aires. Circa: Paris, 1890. 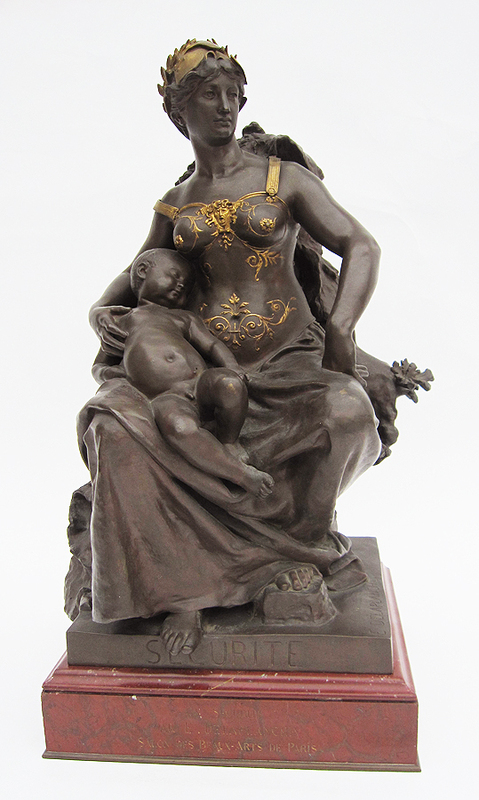 Eugène Delaplanche (February 28, 1836 – January 10, 1891) was a French sculptor, born at Belleville (Seine). He was a pupil of Duret, gained the Prix de Rome in 1864 (spending 1864-67 at the Villa Medici in Rome), and the medal of honor in 1878. His "Messenger of Love" (1874), "Aurora" (1878), and the "Virgin of the Lillies" (1884), are in the Luxembourg. Other works by him are "Music - La Musique" (1878, Paris Opera House), called his masterpiece; "Eve After the Fall" (1869); "Maternal Instruction" (1875, Square of Sainte-Clothilde, Paris). He is also noted for his decorations in relief on vases of Haviland faience. His best work is naturalistic, but at the same time dignified and simple in line, and shows sound mastery of technique. He is represented by 15 works in the Glyptothek, Copenhagen, and in many other French museums and in churches. This sculpture of La Sécurité is after his 1884 sculptures of "Security and Commerce" in the Hôtel de Ville, Paris (replicas in the Chicago Art Institute). Square Samuel-Rousseau, 7th arrondissement, Paris.